The promise of a great harvest. It’s been a wild week for us! We received our seed potatoes and onion sets on Wednesday from Moose Tubers in Waterville, Maine. We try to get our ordern to them in early January, hoping for the best selection. This year we are growing 10 varieties of spuds. I remember when I first came to the farm five years ago, I had thought that potatoes were virtually all the same, regardless of the variety. Oh contraire! Not only do they vary in skin and flesh color, but their texture and flavor are unique to each variety as well. Some are good for baking or roasting, while others are better mashed or in salads. There are some varieties that can literally make me swoon, like Purple Vikings, Rose Finn Apple Fingerlings and Katahdin. Potatoes prefer well-drained fertile soil. As some of you know, we grow in clay which is a blessing and a curse. A blessing when most things go well and we get plenty of sunshine, a curse when Mother Nature sends too much rainfall. I’m not much of a gambler, but farming can certainly be a crap-shoot! Normally you plant potatoes when the soil is about 55-60 degrees and dry enough to work easily. We had near perfect conditions this year, as we have not seen rain for over a week. It is also suggested, to plant potatoes when the dandelions are in bloom (which from the looks of it are more than abundant)! Planting has been much easier for us ever since Val’s Potato Rickshaw was constructed. We use this not only for potato and onion planting, but for garlic and tomatoes as well. It saves our knees, backs and our dispositions. Within three days we were able to plant 7,000 sets of onions and 650 pounds of seed potatoes! The rule of thumb is for every 10 pounds of seed potatoes planted, we should yield 100 pounds of potatoes. As we are not mechanized, that’s a lot of digging! Although extremely labor intensive, it remains a favorite crop. There are early, mid-season and late-season varieties of potatoes. Fingerlings are mid-season and are 5-7 times more expensive than traditional potatoes. This year we opted for two varieties: LaRatte and Rose Finn Apple. LaRatte is yellow-skinned and yellow-fleshed that is plumper than most fingerlings. They are all the rage in Europe and have been described as having a perfect texture. Rose Finn Apple has been a favorite of our farm for several years, with pinkish skin and light yellow flesh. Considered waxy with a dreamy creaminess that is as unforgettable as its name. Our early potatoes are the ever favorite Yukon Gold, its relative Red Gold, and Chieftain. Yukon has a yellow-buff skin and yellow flesh. Its familiarity bodes well at market for those customers who hate change. Red Gold is quite similar to Yukon and comes on even earlier, which makes it all the rage as a ‘new potato’. They need only a light steam and a toss in butter, and a touch of salt. Chieftain comes on a little later, with its red skin and white flesh. Its texture is more floury, which makes it suitable for roasting. Unlike most of the early’s it also stores well. Our mid-season varieties are Purple Vikings and Yellow Finn. Purple Vikings, one of my personal favorites, has pinkish-purple skin with white flesh. Don’t be fooled by its good-looks alone, I found that it really shines in potato salad and is also good baked or roasted. I enjoy combining it with an additional color like Chieftain when I make our Brickyard Farms potato salad. Yellow Finn are pear-shaped with yellow skin and flesh. They are excellent for both roasting and baking and are raved about for home-made gnocchi. Last, but by no means least are our late-season varieties: Bintje, Red Pontiac and Katahdin. Bintje, grown originally by the Dutch (who know a thing or two about potatoes) since 1905. It is the most widely grown yellow-fleshed potato in the world, due to its adaptability to a wide range of soil types, storability and growth habits. It is reported to have exquisite flavor. Red Pontiac with its red skin and white flesh is a favorite for mashed potatoes. This historical potato has been cultivated since the 1800’s and is known for its sweet flavor and creamy texture. Finally we have Katahdin. 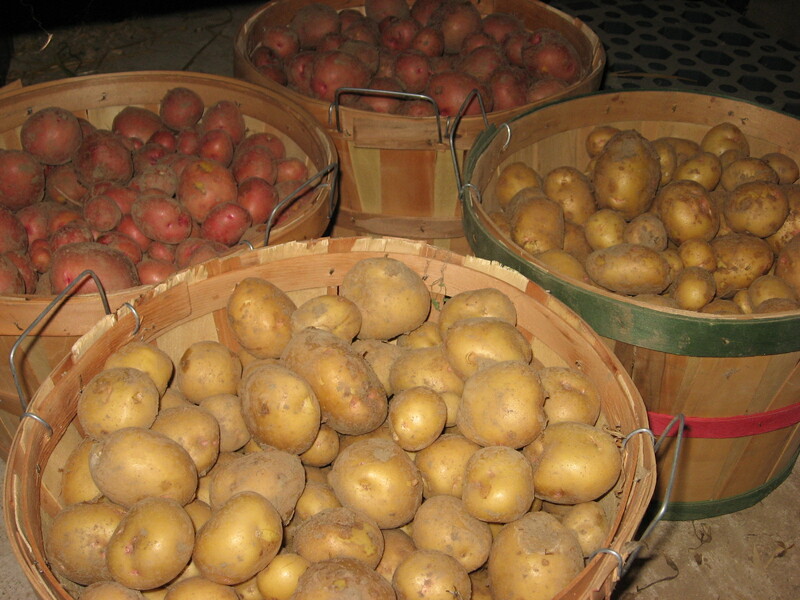 Known by the Irish and Maine potato growers as the choice winter potato. I have never had a better mashed potato in the life! Its texture is so creamy that I close my eyes as I eat. It also stores well, as do most late-season types. Now you might think that with all this potato talk that I might share a recipe for a gratin or potato salad; and that was my original intention. 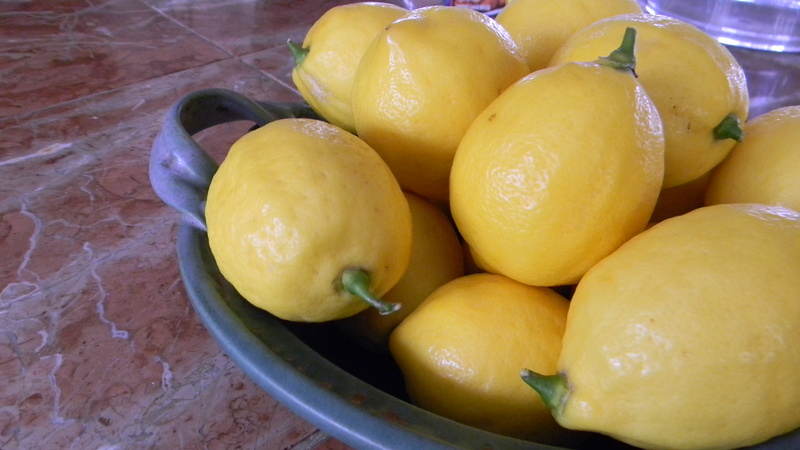 However my sister-in-laws surprised us with 12 of the most beautiful Meyer lemons from the tree in their back yard. We decided to be spontaneous and make Val’s Lemon Bars with them instead. FOR THE CRUST: Spray a 9-inch square baking pan with nonstick cooking spray. Fold two 16-inch pieces of foil lengthwise to measure 9 inches wide. Fit one sheet into the bottom of the greased pan, pushing it into the corners and up the sides of the pan, the overhang will help in removal of the baked bars. Fit the second sheet in the pan in the same manner, perpendicular to the first sheet. Spray the sheets with nonstick cooking spray. Place the flour, confectioners’ sugar, and salt in a food processor and process briefly. Add the butter and process to blend, 8-10 seconds, then process until mixture is pale yellow and resembles coarse meal, about three 1-second pulses. Sprinkle the mixture into the prepared pan and press firmly with your fingers into an even layer over the entire pan bottom. Refrigerate for 30 minutes. Adjust an oven rack to the middle position and heat the oven to 350 degrees. Bake the crust until golden brown, about 20 minutes. FOR THE FILLING: Start the filling as soon as crust is in oven as it will need to be poured into the warm crust. In a medium nonreactive bowl, whisk together the yolks and whole eggs until combined, about 5 seconds. Add the granulated sugar and whisk until just combined, about 5 seconds. 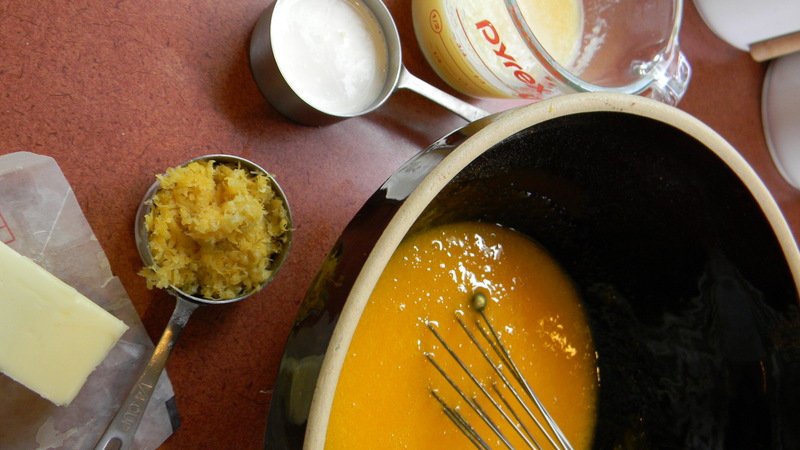 Add the lemon juice, zest and salt; whisk again until combined, 5 seconds more. 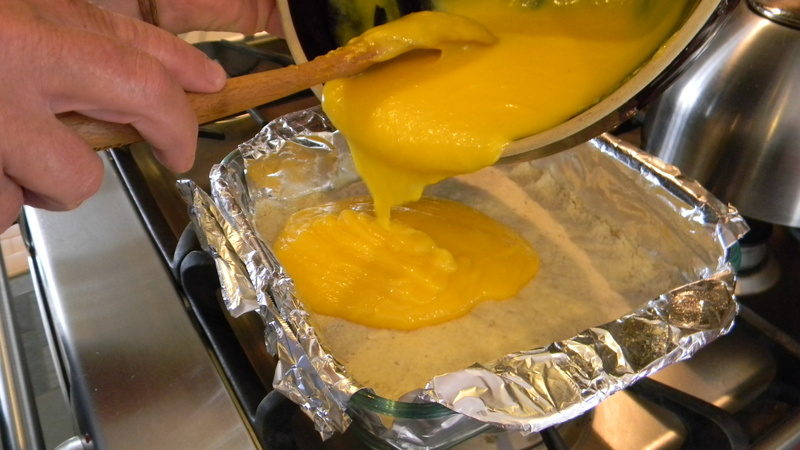 Transfer the mixture into a medium nonreactive saucepan, add the butter pieces, and cook over medium-low heat stirring constantly with a wooden spoon, until the curd thickens to a thin sauce-like consistency and registers 170 degrees on an instant-read thermometer, about 5 minutes. Immediately pour the curd through a single-mesh steel strainer set over a nonreactive bowl. Stir in the heavy cream; pour the curd onto the warm crust immediately. Bake until the filling is shiny and opaque and center 3 inches jiggle slightly when shaken, 10-15 minutes. Cool on wire rack to room temperature, about 45 minutes. Remove the bars from the pan using the foil handles to a cutting board or decorative plate. 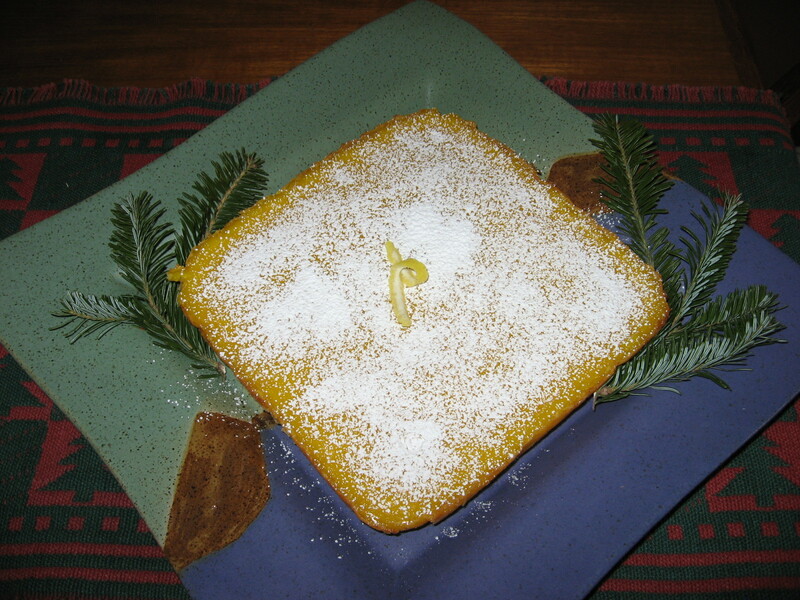 Dust with confectioners’ sugar. Cut into 2 1/4 inch squares, wiping knife clean between cuts as necessary. This entry was posted in Farm News, Raves, Recipes, Uncategorized and tagged brickyardfarms, dessert, eggs, food, lemons, plant potatoes, raves, recipes, seed potatoes. Bookmark the permalink. Great article……….Yummy desert I know for a fact. You made my potato-loving heart go pitter-pat. I totally get that! We’ll keep you posted on all the good news on spuds. Took a visit on your site and will follow your posts. Yum. Such a nice surprise seeing the lemons in your bowl. Thanks for the lemon bar recipe. We will have to try it with some of our remaining lemons. We have some new lemons forming so will surprise you again later in the summer.